Book reviews, news, and a healthy obsession with the written word. As you might imagine, Skippy Dies opens with the death of the titular character, one Daniel Juster (nicknamed Skippy). Skippy dies of mysterious circumstances at a donut shop named Ed’s, then the story jumps back several months to tell the sprawling tale of life at Seabrook College before and after that fateful day. Skippy Dies has a wide-ranging cast of colorful, hilarious and occasionally maddening characters, and the Audible production brings them all to life with a wonderful full-cast recording. Although Skippy is the catalyst for much of what happens in the book, he isn’t necessarily the main character. 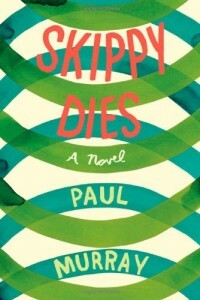 Instead, Skippy Dies is an ensemble story with a half-dozen or more plot-lines that weave in and out of Skippy’s life. First and foremost is the story of Ruprecht Van Doren, Skippy’s roommate. Ruprecht is socially awkward, horribly overweight, exceedingly intelligent and obsessed with string theory. At one point in the book, Ruprecht manages to convince his friends to test a device that might open a portal to another dimension if only they can get it into the girl’s school next door. Then there’s Carl and Barry, two burnouts who start selling “diet pills” bartered from kids with ADHD to girls looking to lose weight fast. Carl is dangerous, psychotic, and hopelessly in love with a pretty girl named Laurie, who is also Skippy’s number one crush. Despite the seemingly huge gap in their social stations, Laurie and Skippy do actually get together at one point in the book, and it only inspires more fits of rage and destruction on Carl’s part. Murray doesn’t just focus on students, however; he also tells the story of Howard “The Coward”, a Seabrook alum who finds himself back at school, teaching history to the sort of kids he was not so long ago. Howard, who has a loveless relationship at home and terrible guilt from an “incident” that happened years ago, barely holds the respect of his students until a pretty substitute comes to Seabrook and up-ends his life. Howard also butts heads with Greg “The Automator”, acting headmaster of the school, who seems to care more about branding and merchandise than education. The Automator is the kind of subtly dangerous imbecile who tends to rise to the top in management positions out of sheer bloody-mindedness. All of these characters and more interact in scenes that are hilarious, touching and occasionally even disturbing. Murray weaves mundane events, satire and occasional flights of fancy with such a deft hand that he makes Seabrook College feel like a living, breathing world. The book is simultaneously epic and intimate; filled with lofty ideas and discussions of the nature of reality, but focused entirely on life in a small community in Ireland. Skippy Dies is a huge, long book, but if you have the time, I highly recommend the audiobook version. The full cast recording makes the world of the book feel more real and makes it easier to keep track of the huge cast of characters. Full of Words is a blog for book-obsessives written by a book-obsessive. Reading, critical thinking, analysis, reviews, news, interesting book covers, and much more.